The Vault is Slate’s new history blog. Like us on Facebook; follow us on Twitter @slatevault; find us on Tumblr. Find out more about what this space is all about here. This Foreign Service memo treats a science-fictional subject—the existence of the Yeti, or the Abominable Snowman—with utmost bureaucratic seriousness. 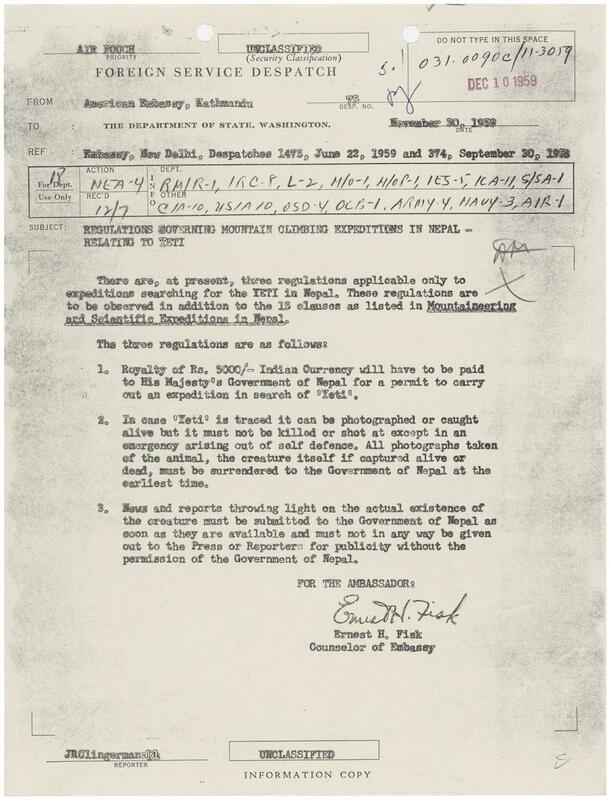 Titled “Regulations Governing Mountain Climbing Expeditions in Nepal—Relating to Yeti,” it was issued from the American Embassy in Kathmandu on November 30, 1959. The memo came at the end of a decade of strenuous Yeti-hunting. This Outside Magazine timeline of Yeti hunts tells the story in compact form. In 1953, Sir Edmund Hillary and Tenzing Norgay climbed Everest, and reported seeing large tracks. In 1954, the Daily Mail (UK) funded a sixteen-week “Snowman Expedition” to Everest to look for clues. (The newspaper is still on the case today.) And in the late 1950s, American oil millionaire and cryptozoology enthusiast Tom Slick—whose colorful life, as Badass Digest points out, should definitely be made into a movie—bankrolled a number of Himalayan expeditions in search of the creature. Did the U.S. government believe in the Yeti, as some cryptozoologists took the memo to mean? The memo stipulated three rules: Yeti hunters must pay the Nepalese government for a permit; hunters can photograph, but not kill, any Yeti that surfaces, and must turn any photographs or captured Yeti over to Nepali officials; and new findings need to be filtered through Nepalese channels before going public. These regulations were actually first issued by the government of Nepal in 1957. The U.S. established diplomatic relations with Nepal in 1947, and the embassy had just opened in 1959, when the memo was written. The Yeti presence in a State Department document doesn’t prove that the U.S. believed in the Snowmen. Rather, by reprinting the Nepalese government’s regulations, the embassy could show Nepal that the U.S. respected its sovereignty, even in the matter of hypothetical hairy beasts. Thanks to Mark Murphy of the National Archives. “Regulations Governing Mountain Climbing Expeditions in Nepal - Relating to Yeti”; UD-WW, 1454, , Box 252, Accession #64-9-0814, folder 5.1 Political Situation - General, File ended Dec 31, 1959; Records of the Agency for International Development; Record Group 286; National Archives.